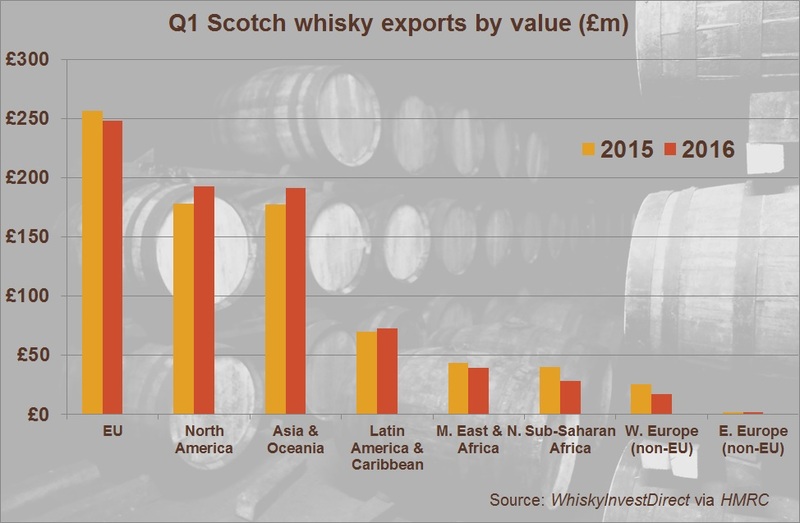 SCOTCH WHISKY exports' recent decline continues to slow according to the latest data, as signs of growth appear in the European Union and North America, write Rupert Patrick and Leon Kuebler at WhiskyInvestDirect. New figures from HMRC show that Scotch whisky exports for January-March 2016 increased 2.5% by volume compared to the same period in 2015. Exports of Scotch totalled £792m by value over the first three months of the year – constant with the start of 2015, showing just a marginal 0.1% decline overall. A total of 70.3m Litres of Pure Alcohol (LPA) were exported over these three months – the equivalent of 240m bottles, or 30 bottles every second. This was Scotch’s best Q1 performance since January-March 2013 in both volume and value terms, and halts the two-year slide in Scotch’s Q1 figures. Q1 is traditionally the weakest quarter for Scotch whisky exports, having averaged one-fifth of the annual total by value in the years 2010-2015. By way of comparison, Q4, which encompasses the busy Christmas and New Year build-up of October to December, has averaged 30% of annual sales over the same period. As Q1 has formed a consistent percentage of between 19% and 21% of the annual total value over the last five years, it can be judged a relatively good indicator for the prospects of the coming year. 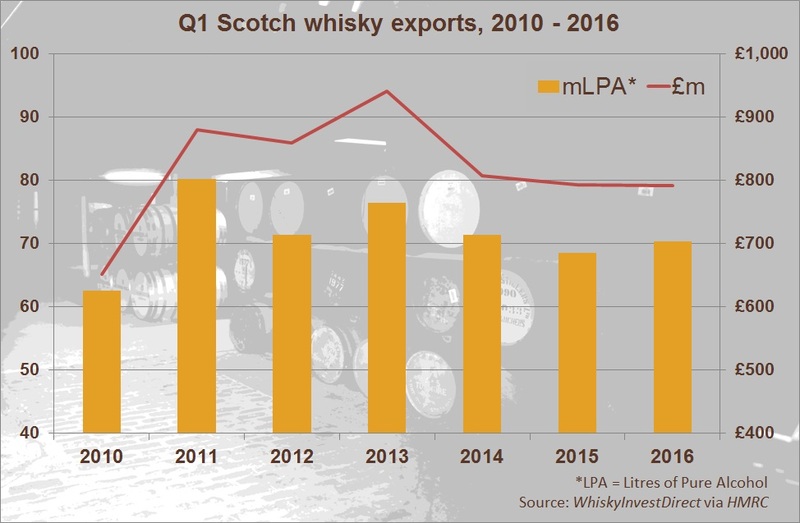 The improvement in Scotch’s Q1 performance compared to the figures for January to March of last year suggest that the slump in whisky exports, which began in 2014 after a stagnant year in 2013, has slowed. This echoes our conclusion drawn from the 2015 HMRC figures, first reported by WhiskyInvestDirect in February, that the two-year decline in Scotch whisky exports has lessened. Exports to Scotch’s two main markets – the European Union and North America, worth £2.2bn combined in 2015, some 55% of worldwide exports – remained solid in Q1. North American imports rose by 8.2% by value year-on-year despite declining 3.4% by volume, as exports continued to increase to the largest national market for Scotch by value, the United States, and the fastest growing major market, Mexico. By contrast, exports of Scotch to the European Union declined 3.1% by value in 2016 Q1 compared to the same quarter of 2015. However, the volume of Scotch sent to the Common Market rose by 6.4% over the same period, thus realising the first Q1 growth since 2013 and indicating renewed demand for the UK's largest food and drink export within the EU in the process. While exports to the European Union declined slightly, these markets performed far more strongly than those Western European nations outside of the Common Market. Exports to Non-EU Western Europe in 2016 Q1 declined by 34% in value and 22% in volume compared to the first three months of 2015, the worst rates posted by any region. Only Sub-Saharan Africa saw a similar decline over the same period. Between January and March, the value of Scotch exports to Turkey, Switzerland and Norway declined by 45%, 20% and 31% respectively in 2016 when compared to 2015. In total, these three countries alone registered a decline of £8.7m, down some £750,000 or 10%. That drop was greater than the decline registered by the whole European Union combined, despite the Non-EU Western European market being less than one tenth of the size of its EU counterpart. Both the Government and the Scotch Whisky Association have raised concerns about the damage which could be inflicted to the Scotch whisky industry should Britain decide to leave the European Union, losing membership access to the region's single market. The spirit's strong branding, however, plus its deep and broad global penetration, could be expected to defend export demand. Other regions performed far better in Q1 than non-EU Western Europe. Asia & Oceania grew in value and volume alike, with double-digit growth posted in both categories by India (10% value, 40% volume) and Singapore (21% value, 12% volume). This indicates that demand for Scotch remains strong in India and China. Non-EU Eastern Europe was the other region which grew by both volume and value. This growth was driven by the resumption of exports of Scotch to Russia after they had stopped completely in 2015. However, the difficulties posed to Russian demand by the drop in oil prices and EU sanctions are still evident, as imports of whisky in 2016 Q1 are still only worth 7.3% of the amount exported there during the same period three years ago.